Author(s): Roelich, K., Bale, C.S.E., Turner B., Neall R.
Municipalities in the UK are increasingly engaging in local management of one or more parts of the energy system. The municipal energy companies set up to manage this engagement have the potential to contribute to a low-carbon transition through acceleration of low-carbon energy technology roll-out and demand management. However, municipal energy companies face many constraints that limit their growth in number and scale and restrict their potential to contribute to climate change mitigation. This paper aims to develop a better understanding of why and how municipal energy companies form to help to identify how policy and regulation could better support their proliferation and their contribution to climate change mitigation. We conducted a longitudinal analysis (from 2013 to 2017) of five UK cities’ attempts to develop new institutional arrangements to engage in the national energy system and contribute to climate change mitigation. We found that the fundamental purpose of municipal energy companies was different to those of the private sector; using energy to deliver essential services and place-specific outcomes, rather than aiming to deliver energy at least cost. The scope of engagement was dependent on a city’s unique characteristics and factors driving decisions. We found that there was no blueprint for a municipal energy company, rather the final form was shaped by a city’s unique characteristics and decision drivers and emerged from a process of experimentation and learning. This ‘pathway’ towards a municipal energy company is also heavily influenced by the changing policy context, meaning that studying the evolution of municipal energy companies over time is very important. Specific changes in UK policy have significantly reduced the potential of municipal energy companies to contribute to carbon emissions reduction. We propose a framework of characteristics, decision drivers and pathways to better understand the evolution of municipal energy companies and to support the identification of policy and regulation that could enable their proliferation. 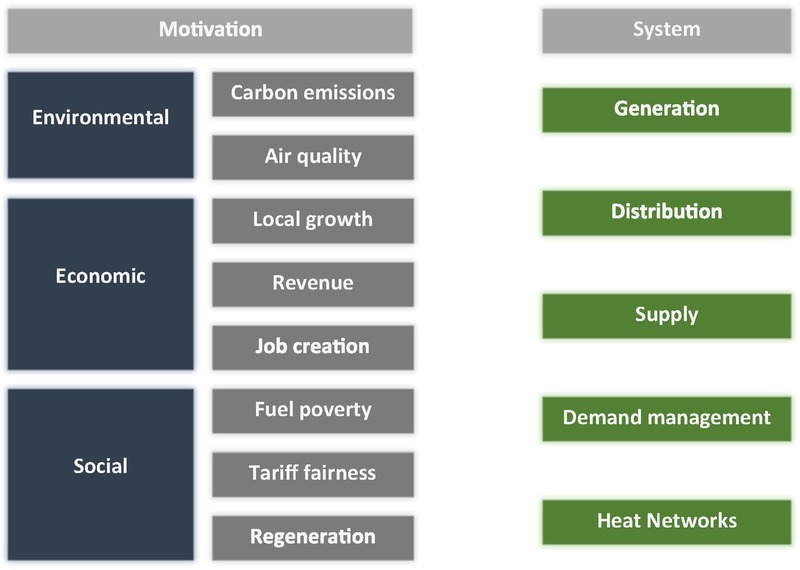 We illustrate the application of this framework to maximise the contribution of municipal energy companies to climate change mitigation in cities. We identified a need for policy to recognise and enable different institutional drivers (including climate change) and institutional forms and encourage experimentation. Furthermore, new approaches to accounting and valuation are needed that capture social and environmental outcomes and outcomes that occur in the long-term.